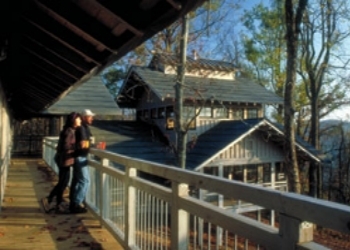 The Len Foote Hike Inn at Amicalola Falls State Park is one of the newest and most unique of Georgia's state park facilities. If you enjoy wilderness hiking but prefer a soft bed, hot showers, and great food instead of camping, the Hike Inn is for you. 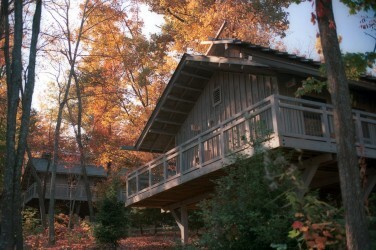 The Inn is accessible only by foot over a moderate 5 mile hiking trail which originates at the top of the Amicalola Falls. Check in at the Park Visitors Center to get vital information and directions for your walk to the Hike Inn. You must check in at the Visitors Center before 2:00 PM or you will not be permitted to hike. The hike takes from 2 to 4 hours, so be sure to start early enough to arrive well before the facilities tour and dinner (5:00 PM & 6:00 PM every night). You only need to bring your personal items, including layered clothing, hiking boots, extra socks, rain gear, toiletries, water (for the trail), sunscreen, insect repellent, first aid kit and flashlight. Please, no pets, cell phones, beepers, or radios. After arrival at the Hike Inn, you can settle in and begin exploring. Cold and hot drinks are available in the dining room. In the cooler months, enjoy wood-burning stoves in the common areas. Dinner and breakfast are served family style. Educational and entertaining programs are conducted in the Sunrise Room after dinner most evenings. Programs consist of everything from worm composting to storytelling. Books and games are also available. The Sunrise Room (as you would expect from the name!) is an excellent place to observe the sunrise in the morning. On the trip back, you may opt to complete a hiking loop by returning via the Appalachian Trail Approach Trail. The Hike Inn is one mile from the Approach Trail. 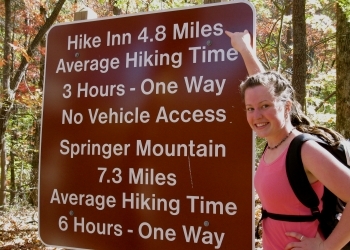 If staying more than one day, you may also choose to hike to Springer Mountain, the southern terminus of the Appalachian Trail, about 4.5 miles from the Inn, or hike on one of the short trails around the Inn. The Trail is entirely within the Chattahoochee National Forest and Amicalola Falls State Park. Although much of the way is an easy walk, there are some climbs of moderate difficulty. The distance markers along the way indicate interesting features and flora on the Trail, so be sure to refer to the literature provided when you check in at the Park Visitors Center. Yellow rectangular blazes mark the Trail, which begins at the Hike Inn parking area at the top of Amicalola Falls. From here, the Hike Inn Trail joins briefly with the blue-blazed Approach Trail to Springer Mountain. Yellow blazes soon diverge from blue and climb to the ridge top. The Trail meanders along, dipping down to small streams and rising to cross over ridges, where at five miles, finally coming to the Hike Inn.